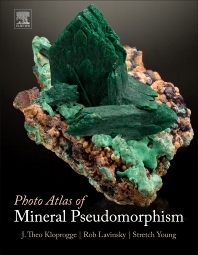 Photo Atlas of Mineral Pseudomorphism provides a comprehensive overview on the topic of pseudomorphism—in which one mineral is replaced by another but still maintains its original crystal form—a phenomenon that is far more common than currently thought and is extremely important in understanding the geologic history of rocks. There are many examples of pseudomorphs, but they have never been brought together in a single reference book that features high-resolution, full-color pseudomorph formations together with the original minerals that they have replaced. This book is the essential reference book for mineralogists, geologists or anyone who encounters mineral pseudomorphism in their work. Robert Lavinsky, PhD Biochemistry (UCSD), was a crystal collector from the age of 12. He first started participating in mineral shows at the age of 14. He initially planned a career in molecular genetics but his passion for minerals led to a career change, founding www.iRocks.com in 1996. Since then, he has been a full-time mineral dealer and educator (particularly in China and online) and recently had the new mineral, Lavinskyite, named after him. Based in Austin, Texas, Stretch works in the semiconductor industry as a mask design manager, previously in the oil and gas industry as a mud logger. He’s also a member of the Mineral Association of Dallas (MAD) and the Austin Gem and Mineral Society (AGMS) where he has held seats on the Board of Directors, Dealer Chairman, Scholarship Chairman, and was chosen as 2013’s Rockhound of the Year. Stretch has won several awards exhibiting Pseudomorphs including the national trophy for the American Federation of Mineral Societies, the Friends of Mineralogy award for best educational display and the Desautels award from the Tucson Gem and Mineral Society for best case at the main show in Tucson in 2009. Many of his Pseudomorphs have been published in prominent mineral magazines and books including an article on Pseudomorphs in Extra Lapis #43. The content of the book is great, but the layout is a bit disappointing. For the size of the page, a single column makes long stretches of text difficult to read. For a photo atlas I would have also been happy to pay more for a ‘glossier’ paper.